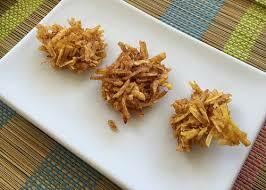 Aranitas de Platano - Shredded Green Plantain Fritters - Tienditadepuertorico.com - Buy Puertorican Food Here!! 1 Combine 4 tablespoons of the butter with the garlic and brandy and set aside. Coarsely grate the plantains into a bowl and season with the salt and pepper to taste. brown, turning once to make sure it cooks evenly. Repeat with the remaining aranitas.